Despite today’s title, this blog post will not be written by the hungry-eyed men of Orange County or the injected women of Beverly Hills. That’s what Bravo! is for. While doctors are wasting silicone on women’s breasts, I’m putting the stuff to some actual practical use in the kitchen. And you should, too. Silicone can be a cook’s best friend. Or a baker’s. It keeps things scratch free while getting every last bit of food from your pan or bowl. Oh, and it can totally handle the heat in the kitchen. Let’s break down some of the best of the kitchen silicone gadgets. Silpats: These things are pretty cool. 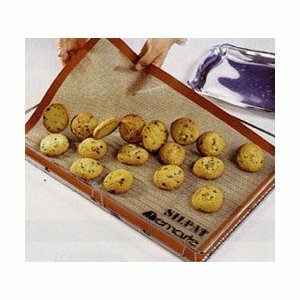 I use parchment paper when I bake cookies, but silpats are the tip-top baking tool. You put it on a pan and it becomes non-stick. No sprays, no curling paper. Just stick-free cookies. Silicone muffin tin: They’re kinda flimsy, but they reduce the need for muffin/cupcake liners, making your baking greener! They can also be used to freeze stuff quickly. You can freeze stock or soup in them and the frozen cubes come out lickety-split for your use! Silicone-covered whisk: If you don’t have a whisk that’s silicone, go invest. Now. Stop reading this blog and go shop. Ok, finish reading, comment, THEN go shop. These whisks are a God-send. They don’t scratch pans when you’re whipping up a roux and they help scrape clean. I will never own another type of whisk. Unless they come up with something more ingenious than silicone, of course. Spatula: Scraper, whatever. These things are commonly mistaken for scraping out all of the cake batter to use for the actual cake. Wrong. They’re used for me AFTER the cake is in the oven. I get ten times more of the raw stuff than I used to get with just my fingers. Tongs: Silicone tongs tend to grip better. And of course, there’s no scratching in your pan when you use them. And they can handle high heat. Oh, and they’re pwitty. Basting Brush: I love traditional basting brushes but let’s face it, they get nasty quick. Silicone ones clean so easily, though they don’t hold marinades as well. But that just means you have to brush more on whatever you’re basting. Clean up trumps function here, people. Thank you to the inventor of these lovely silicone kitchen gadgets, for you make our lives easier and our pans scratch free. What silicone products do you love using in the kitchen?